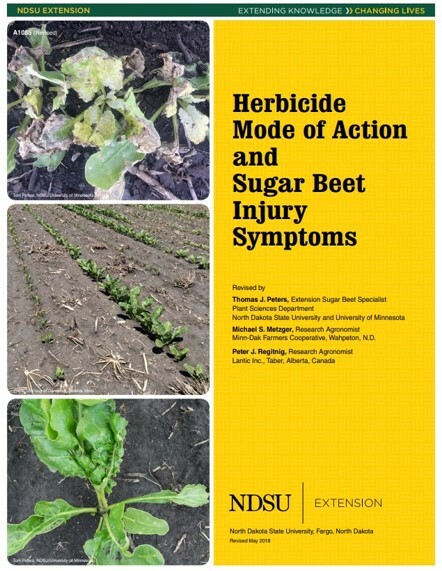 Over the course of this past winter, Dr. Tom Peters (NDSU/U of MN), Peter Regitnig (Lantic Sugar) and Mike Metzger (MDFC) authored the technical publication – “Herbicide Mode of Action and Sugarbeet Injury Symptoms”. This is the second edition of this technical bulletin. The first was published in 1994 by Dr. Alan Dexter with the intent of describing herbicide mode of action and the resultant sugarbeet injury symptomology. As you well know, modest development of new herbicide families has occurred over the past 25 years. This updated publication was developed to articulate our current understanding of herbicides and how they may injure sugarbeet. Click the photo below to download (pdf).